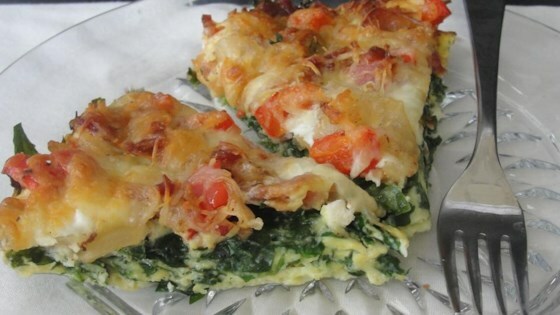 "This is very similar to a famous Missouri bakery's recipe for spinach bacon egg souffle. This method is faster and easier, so it works better for families!" Preheat oven to 350 degrees F (175 degrees C). Grease a 9x13-inch baking pan. Beat eggs in a bowl using a fork. Add milk, garlic salt, and black pepper to eggs and beat until fully integrated. Place bacon in a large skillet and cook over medium-high heat, turning occasionally, until evenly browned, about 10 minutes. Transfer bacon to a paper towel-lined plate and drain grease from skillet. Chop bacon. Saute red bell pepper and onion in the same skillet over medium-high heat until tender, 5 to 10 minutes. Spread spinach into the bottom of the prepared baking pan; top with bacon and red bell pepper mixture. Pour egg mixture over bacon mixture and sprinkle Monterey Jack cheese and Asiago cheese over egg mixture. Bake in the preheated oven until a knife inserted in the center comes out clean, 35 to 45 minutes. Try this delicious savory bread pudding at your next brunch get together. I made this recipe for brunch today. I added red & green peppers, green onions, spinach, turkey sausage and bacon with fresh garlic. #Delicious.